Indigenous Knowledge Inquiries is an essential manual for designing international development projects to be informed by indigenous knowledge. This practical book offers a range of approaches from how to design and manage a research project with a quick and limited indigenous knowledge component, to how to construct projects intended to involve a more long-term and through indigenous knowledge investigation. It sets out guidelines on project design that take into account scope of objectives, time and costs involved. It examines the critical issue of effective team functioning, presenting options for reducing conflict, and for effectively addressing the views of all primary stakeholders. 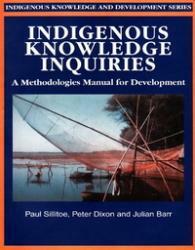 Including coverage of novel of topics such as computer-aided analysis of qualitative data, and the use of cross-cultural research staff, and remaining critically aware of contemporary reflective practice, this is a wide-ranging and insightful guide for all those with any level of interest in indigenous knowledge. A key handbook for international development project managers, anthropologists, and researchers and students of indigenous knowledge.